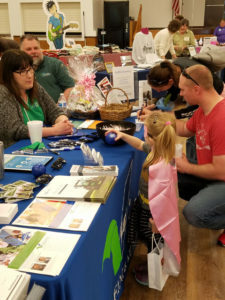 Thurmont’s business community put its best foot forward on Saturday, April 28, 2018, with its annual Thurmont Business Showcase. 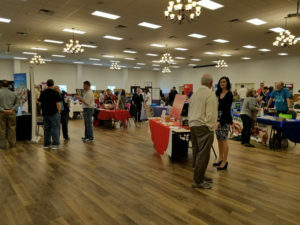 Forty local businesses and nonprofits set up tables in the Thurmont Ambulance Events Complex to introduce members of the community to what they each offer. She was one of the many attendees who steadily streamed into the event complex and wandered around the room, table to table. They could view veterinarians, artisans, restaurants, home businesses, and funeral homes. This year was the first time that Michele Maze set up a table at the Showcase. She moved to Thurmont in 2016, and she supported the Showcase to be a part of the community. It also gave her the opportunity to show her business, Seven Dragonflies Studio, to the community. Many of the businesses were also handing out samples or swag, which the children enjoyed. The Thurmont Ambulance Company offered food and drink. This is the Showcase’s second year at the Event Complex, and it is one of the oldest events that Thurmont Main Street sponsors. It was an event that helped Thurmont get its Main Street designation. The designation opens Thurmont up to getting help to improve its economy and the appearance of the business district.